The Turner Prize list is out and one of the artists doesnt even consider themselves an artist. The age of the un-artist begins. Barry Blinderman's program at ISU is what sparked my interest in contemporary Art. Up to that point I was mostly interested in art history and not living artists. Yes there was an Alex Grey show (probably my first art opening) but really it was the fact that there was a space that I could return to over and over and there was something different every time I walked across town when I was an undergrad. Congrats Barry! 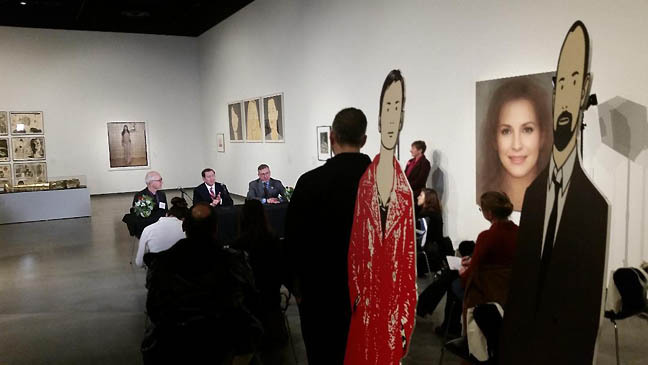 A little over a week ago I was fortunate to catch the opening of the new Jordan Schnitzer Museum of Art at Washington State University in Pullman. 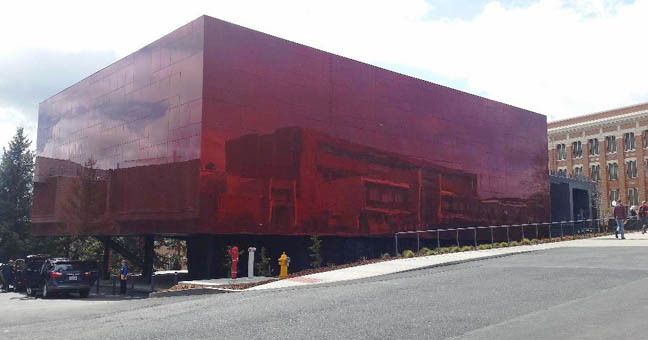 Nicknamed the "Crimson Cube" for the structure's exterior it gives students and other visitors a landmark to navigate by. It is a nice touch since so many other University art spaces are hard to find and seem tied only to art departments, which often have little pull on campus politically and makes the susceptible to cuts. 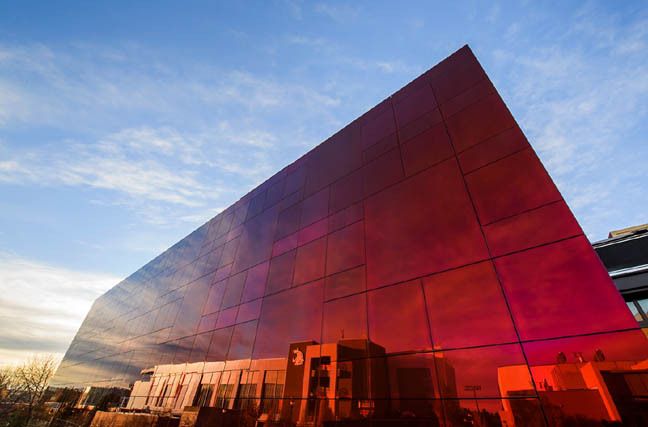 No problem with that here because the cube is intentionally at the heart of things at WSU. 20 years ago this sort of reflective glass structure would have read as corporate but the cantilever that is subtly off other building's grid axis and the red color are distinctly more curious than an office tower's comportment. The overall effect is, "what is that?" and the JSMOA's comparative minimalism recalls David Chipperfield's excellent library in Des Moines. That curiosity prompt is a good place to start for any art museum and has its roots in Robert Smithson's mirrored displacement works without the specificity that Art has. That is left for inside. The new Director of the Met is Max Hollein. This isnt a surprise and it is a rare thing to not promote from within but it really had to happen. Can the museum regain its composure as a seat of expertise... a place where knowledge and experience is rewarded? Can the museum update itself without undermining its greatest strengths and integrity? It doesnt need to reinvent itself so much as reassert itself with tech. Most 1st tier museums really dont understand these things and dont have to but Hollein's predecessor opened pandora's box already. (*hint) All museums should be free of charge, especially with income inequality the way it is. Richard Speer writes a touching memorial for author and Portland art collector Sandra Stone. She showed up at so many openings and was always engaged and involved. I'll miss her. Meet Mitchell Algus, art dealer... trailblazer. Individuals who stick their necks out to create a climate of exceptional activity are rarely rewarded but they are crucial. Amid complexities of gentrification LA's 356 Mission will leave its space. This is no surprise but it shows how the art and real estate market can undermine contemporary art's moral position. There are ways to do this in a way that enhances the community rather than be seen as some colonizing situation. Considering the political climate in the USA we need to not pit these natural allies of artists and POC against each other. Tyler Green does a podcast on the Fazal Sheikh survey currently at the Portland Art Museum. A Macarthur Fellow, Ive yet to catch this exhibition but it is on my must see list. Italy's far right party wants to fascist party's old HQ into a museum? Museums in the USA are themselves at the heart of the class war debate but it looks like Italy is upping the stakes... The world is not a safe place, act accordingly.